Gangrene is the progressive death of body tissue resulting from a lack of blood supply and infection. When the blood supply is cut off, the tissue does not get enough oxygen and begins to die. Dry gangrene—Lack of blood supply causes the tissue to die. 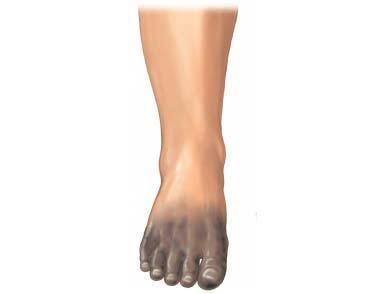 Wet gangrene—Usually occurs when the tissue is infected with bacteria from an injury. The tissue becomes moist and breaks down. A rare wet type called gas gangrene, develops from specific bacteria deep inside the body. Gas gangrene can be a result of surgery or trauma. Gangrene is caused by infection or a reduced blood supply to tissues. Gangrene is more common in older adults. If the gangrene is widespread, sepsis can occur. If you have chronic health conditions, follow the treatment plan outlined by your doctor. If you have diabetes, inspect your feet every day for cuts, sores, or wounds. Care for any cuts, sores, or wounds promptly to avoid infection. If you need surgery, ask your doctor about taking antibiotics. This is especially true if you need intestinal surgery. A quick summary of the 6 types of necrosis. Pathology Student website. Available at: http://www.pathologystudent.com/?p=5770. Accessed August 18, 2017. Clostridial myonecrosis. EBSCO DynaMed Plus website. Available at: http://www.dynamed.com/topics/dmp~AN~T113907/Clostridial-myonecrosis . Updated October 1, 2014. Accessed August 18, 2017. Gangrene. Johns Hopkins Medicine website. Available at: http://www.hopkinsmedicine.org/healthlibrary/conditions/infectious%5Fdiseases/gangrene%5F134,151. Accessed August 18, 2017. Gangrene. NHS Choices website. Available at: http://www.nhs.uk/Conditions/Gangrene/Pages/Introduction.aspx. Updated October 13, 2015. Accessed August 18, 2017. Sepsis in adults. EBSCO DynaMed Plus website. Available at: http://www.dynamed.com/topics/dmp~AN~T115805/Sepsis-in-adults . Updated July 28, 2017. Accessed August 18, 2017.